August 4, 2015: The Weird Food Purchase of the Day – Peanut Butter Soda! 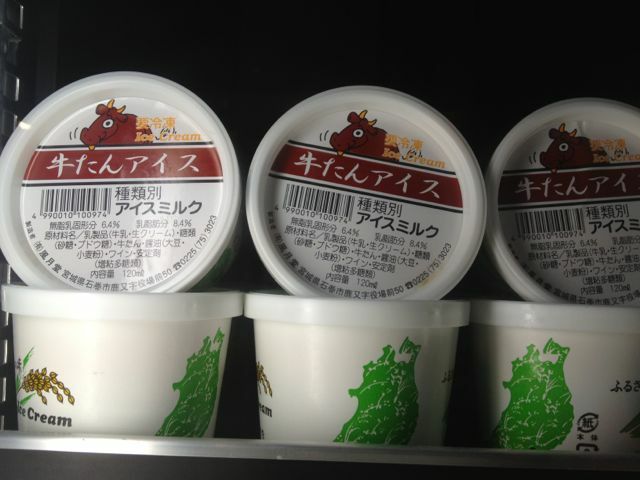 July 27, 2015: Weird Food Purchase of the Day! Dark Matter links! July 26, 2015: The Weird Food Purchase of the Day – Soda Edition! Celery Soda! May 27, 2014: The Weird Food Purchase of the Day = Kombucha! May 26, 2014: The Weird Food Purchase of the Day = Nutritional Yeast! April 13, 2014: The return of the Weird Food Purchase of the Day! 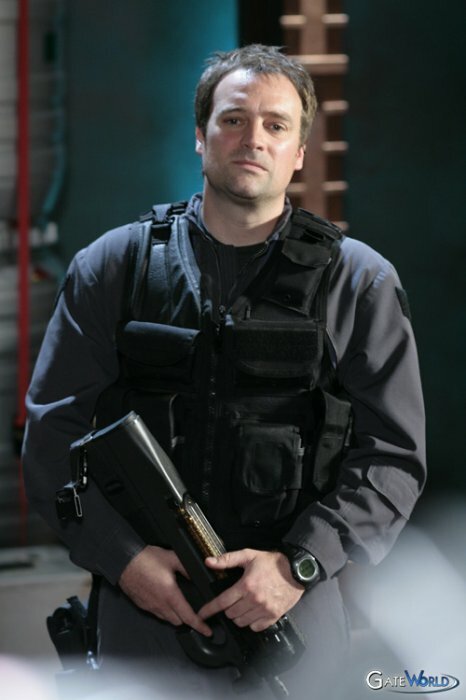 Our Stargate: Atlantis re-watch continues with…Tracker! Continuing our Stargate: Atlantis re-watch with…Tracker! A great episode from start to finish. Unlike many of the episodes I can nitpick after repeat viewings, this one actually gets better with time. A great, fun, fast-paced script by Carl Binder. One of my favorites. 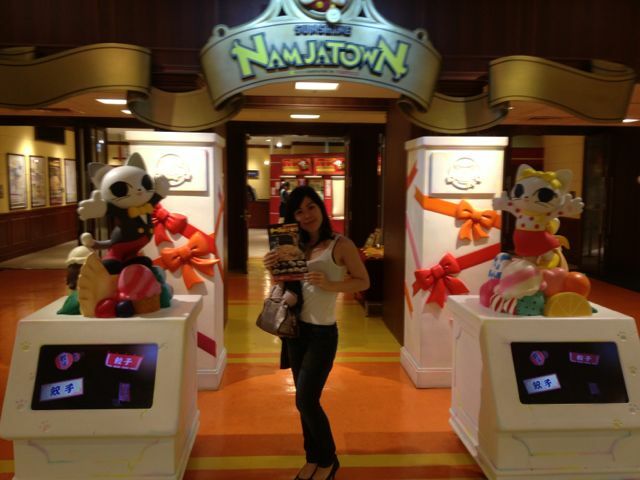 And Akemi loved it as well. And when she spotted actor Mike Dopud, who she instantly recognized even though his back was turned to camera in his very first shot: “Mike Dopud!” By the way, it’s never just “Mike”. It’s always the complete “Mike Dopud”. Akemi was on the edge of her seat (aka the bed) throughout and a couple of moments made her jump and scream – once so suddenly and loudly that a startled Bubba got up and moved over to my side of the bed where he spent the rest of the night. On the wraith sport of hunting runners: “What game wraith play? So bad taste. Who want to do it? High risk, no?” Hey, you won’t even catch me driving the extra three blocks for bison burgers, much less hunting armed prey for sport. Not much in the way of dazzling visual effects in this one, but she did praise the shot of the teleportation device fastening itself to Kiryk’s wrist: “Looks really real!”. Yep, that’s what we were going for. Some sadness when Kiryk disappears through the gate, taking the wraith with him, and it became apparent to Akemi that he wouldn’t be hanging around: “Mike Dopud doesn’t join Atlantis?” I told her, sadly, no. She was disappointed and then, upon further reflection: “Poor Mike Dopud. They don’t need two handsome guys. 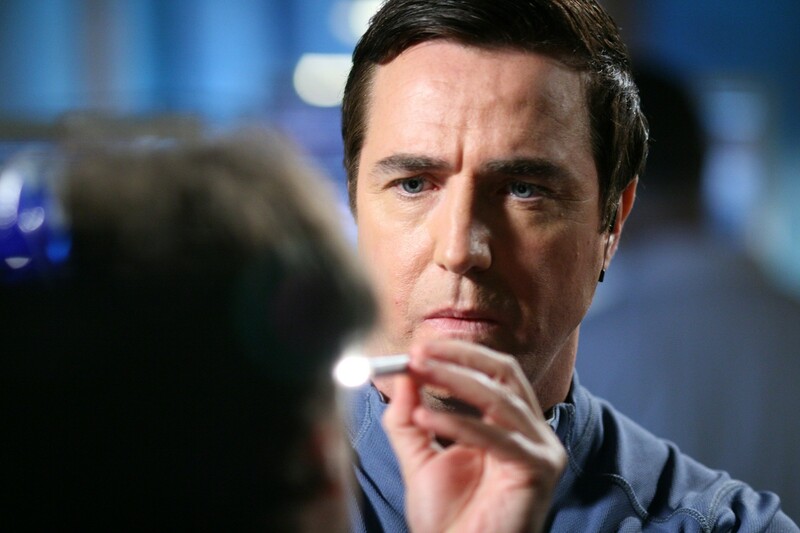 Just one handsome guy and done.” It would’ve been like having TWO archaeologists on SG-1! Finally, she loved the romantic rivalry between McKay and Ronon. On the one hand, I know that she finds Ronon very handsome, but on the other I know she finds McKay quite loveable, so I had to ask which one she would choose. After some consideration, she finally answered: “McKay. I like geek boy more than handsome guy.” Uh, in this particular case or in general? Never mind. November 8, 2012: The return of The Weird Food Purchase of the Day! Gyoza Stadium! Ice Cream City! Nodaiwa! Today, Akemi and I headed over to Ikebukuro’s Sunshine City Mall, home to Namco Namja Town’s Gyoza Stadium and Ice Cream City. It’s been some five years since my last visit to Ice Cream City (I still flashback to the aftertaste of that squid ice cream) and I was looking forward to the return trip. This would be Akemi’s first time and she was incredibly excited. So, did it live up to the hype? In two words: You bet! We started off by hitting Gyoza Stadium, home to about a dozen stands specializing in about a dozen preparations of the Japanese-style dumplings. It’s less a stadium and really more of a theme area, lantern light-lined narrow alleyways and faux watering holes harkening back to a 1920’s Shanghai. 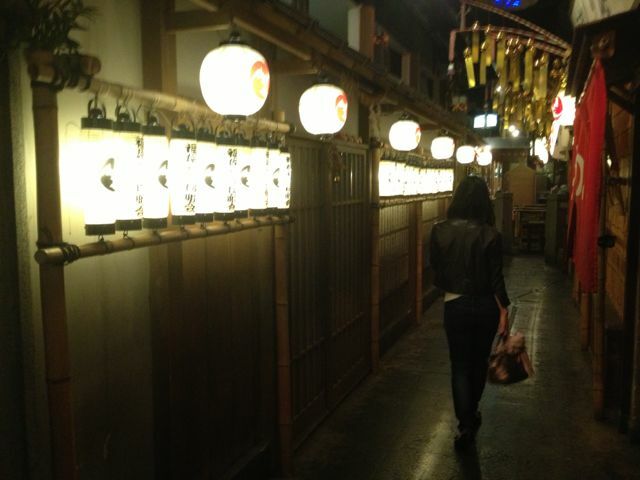 Walking the alleyways of Gyoza Stadium. We wound our way through the various gyoza stands, taking in the dizzying array of preparations. 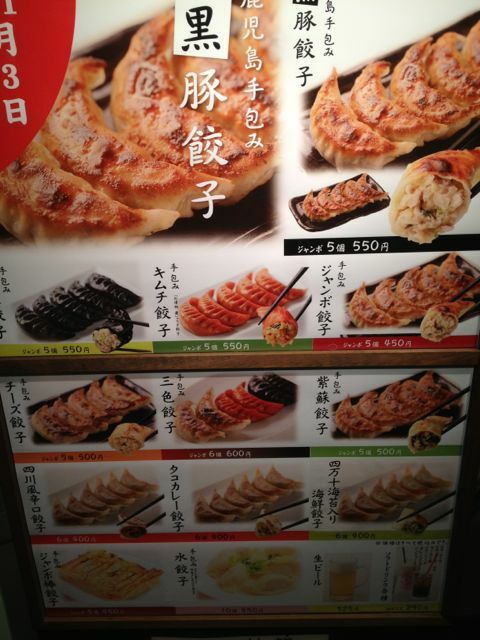 In addition to the menu itemizing the various choices, a general rundown of each stand’s gyoza philosophy – thin vs. thicker wrapper, use of garlic, etc. – offered some help in the decision-making process. All the same, it wasn’t easy. 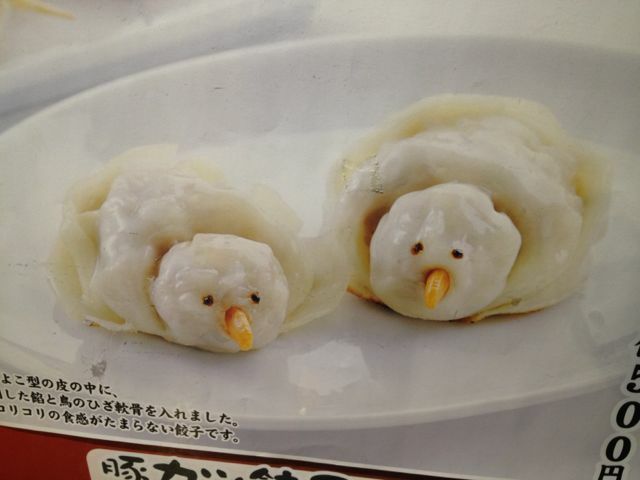 I liked the look of these snowmen-looking gyoza. Eventually, we settled on three stands and placed our orders. 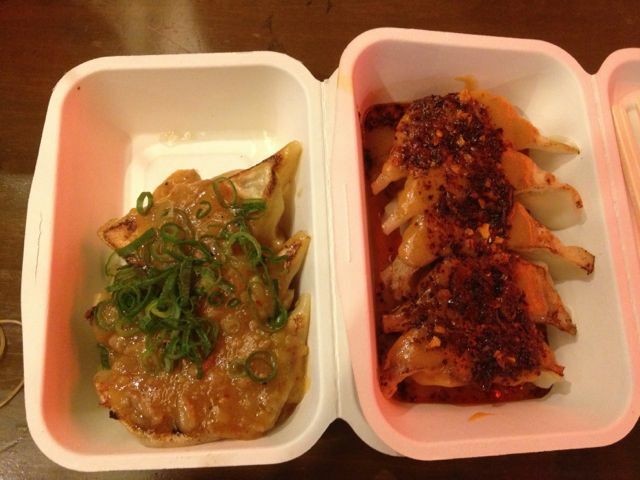 From left to right: Garlic gyoza – tiny, but they packed a significant garlic kick. 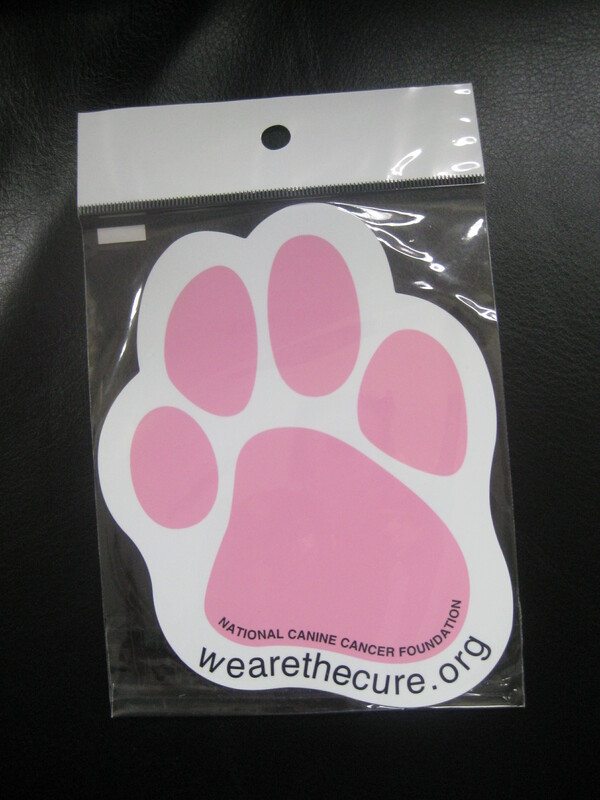 Our favorite. Beside them, a gyoza medley. From bottom to top: regular pork, kimchee, and charcoal. 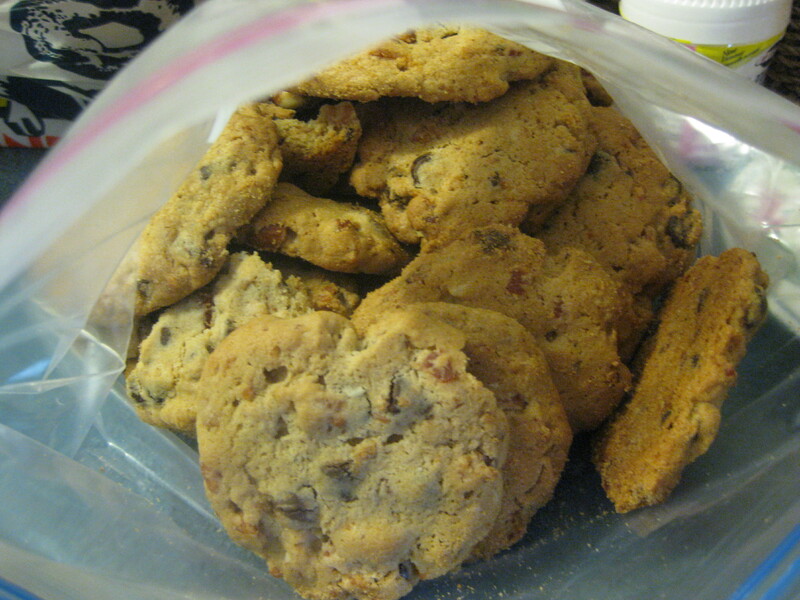 I liked them although Akemi found the wrapper too thick. 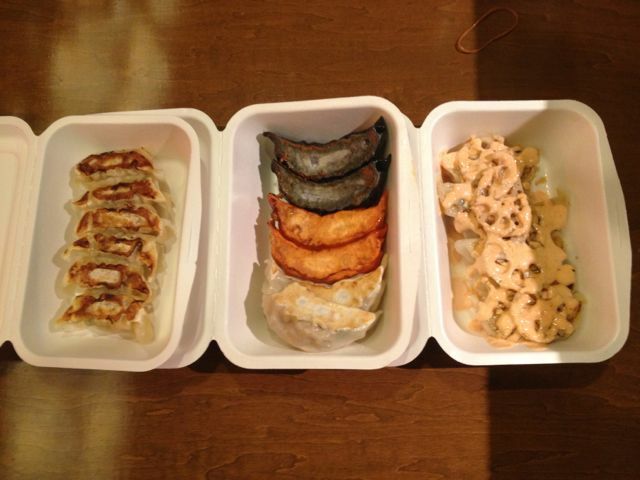 And, finally, on the far right, mentaiko (cod roe)-mayo gyoza topped with lotus root. Great. 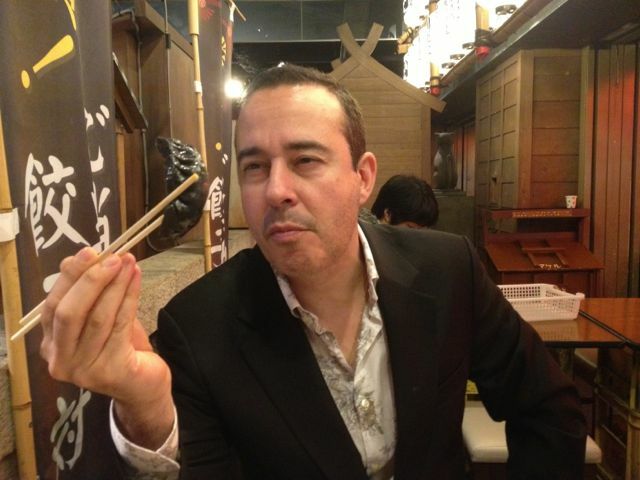 I contemplate my charcoal gyoza. We were done – but not DONE. From left to right: Mapo tofu gyoza – I figured they would be stuffed with tofu but they were actually stuffed with pork. And a lot of it. It was topped with mapo tofu which is comprised of bean curd and a spicy chili sauce. I liked it but thought it was a bit too meat heavy. Next to it, the spicy gyoza that, after the mouth-blasting ramen I had at Ippudo the other day, tasted downright tame. 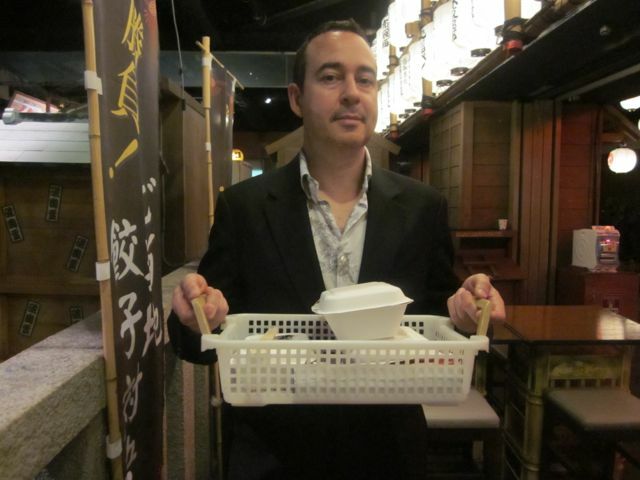 I couldn’t resist sampling Gyoza Stadium’s version of the Siu Long Bao. 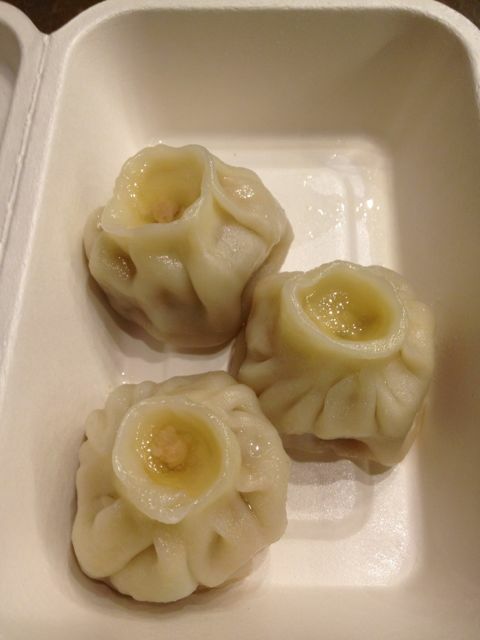 More of a dumpling than a gyoza, I found the skin a little too thick. We were stuffed. We couldn’t eat another bite. Of gyoza. 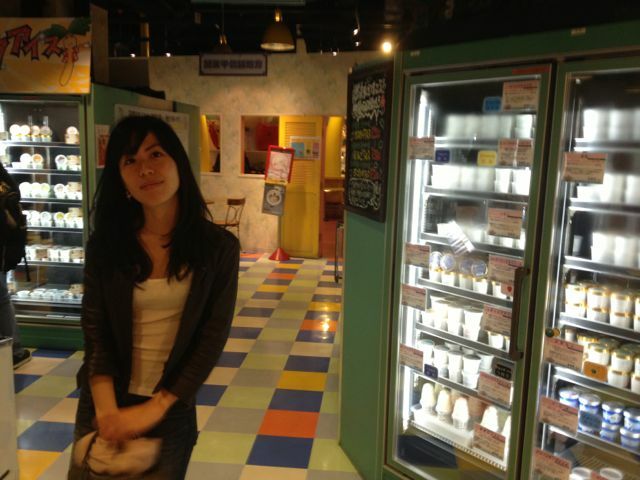 So we headed over to Ice Cream City to peruse the some 300 flavors available. 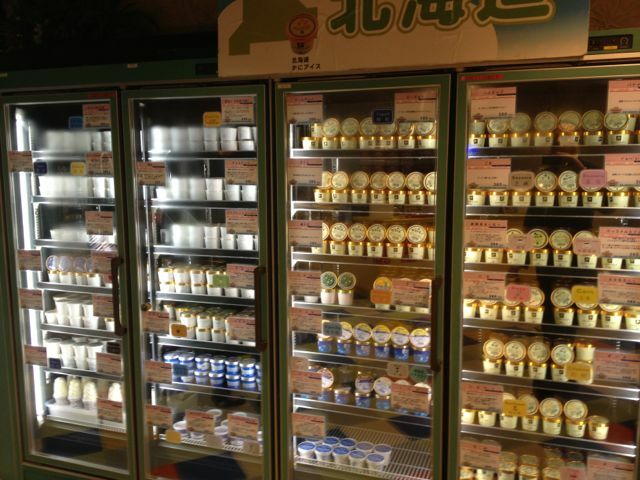 Just some of the selection at Ice Cream City. You like chicken wings? You like ice cream? 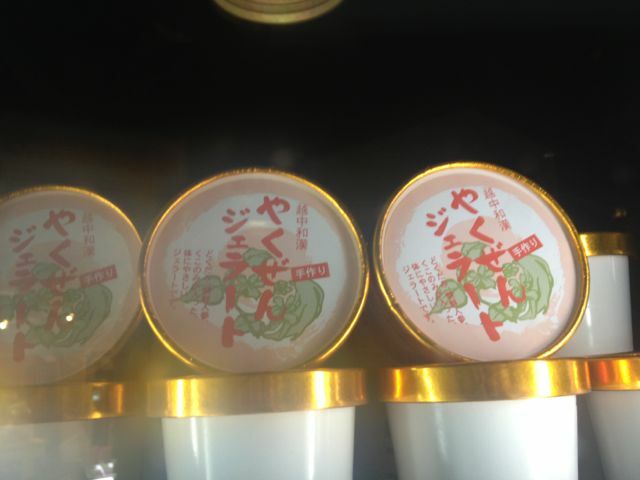 Chinese herbal medicine flavor! A Carl Binder favorite! And viper. Yes, the snake and not the car. 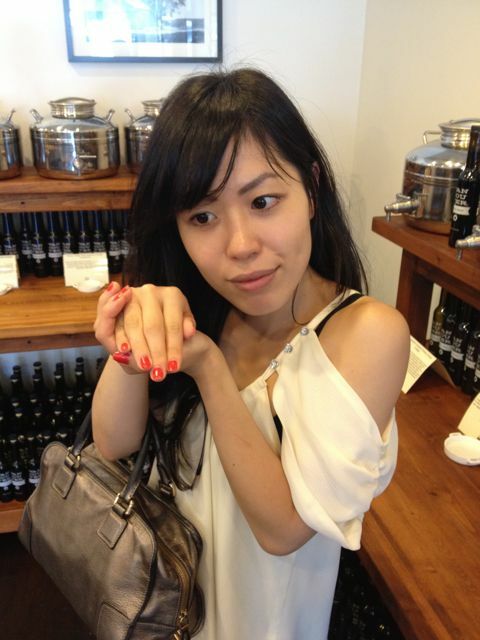 Akemi tests her skin age. 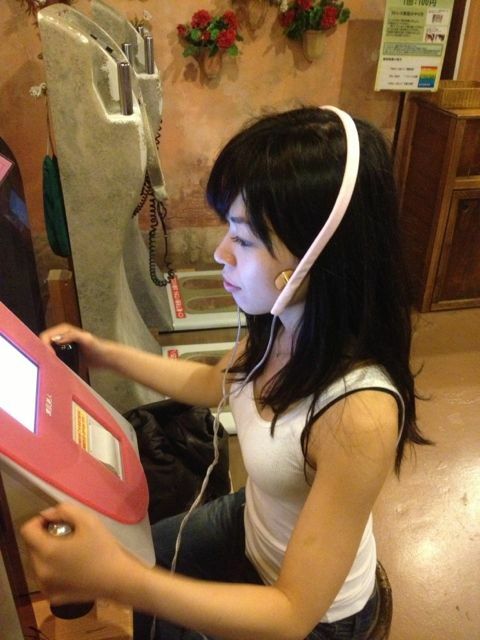 There were also machines that tested your “body age”, stress level, and blood pressure. What fun! 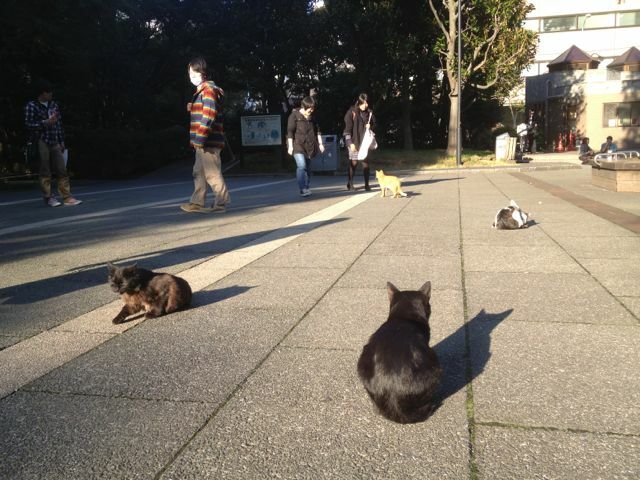 Finally, on the way back to the subway station, we came across THIS tiny park frequented by a bunch of laid-back cats. I assume they’re wild but they didn’t seem to mind human company in the least, either ignoring passersby or sauntering over for attention. Tons o’ fun! If any of you get to Ice Cream City before my return visit next year, please sample the snake ice cream and post the results. 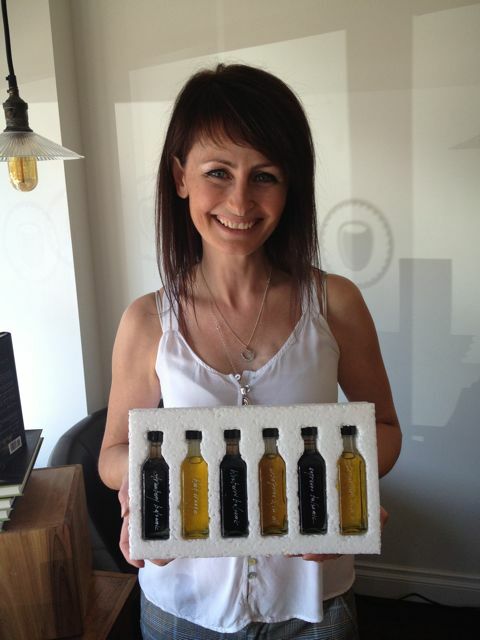 August 17, 2012: Vancouver Olive Oil Company! The Weird Food Purchase of the Week returns! 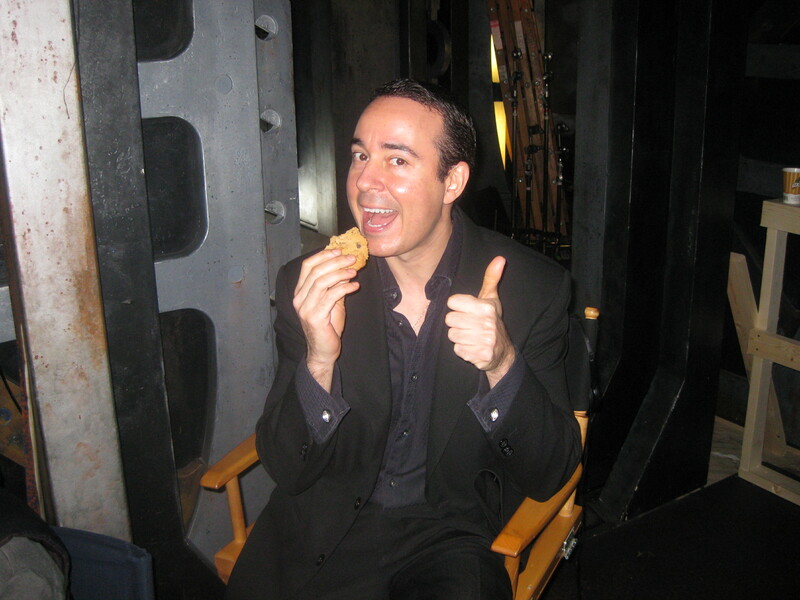 Days of Stargate Atlantis Past! The Tao of Rodney! 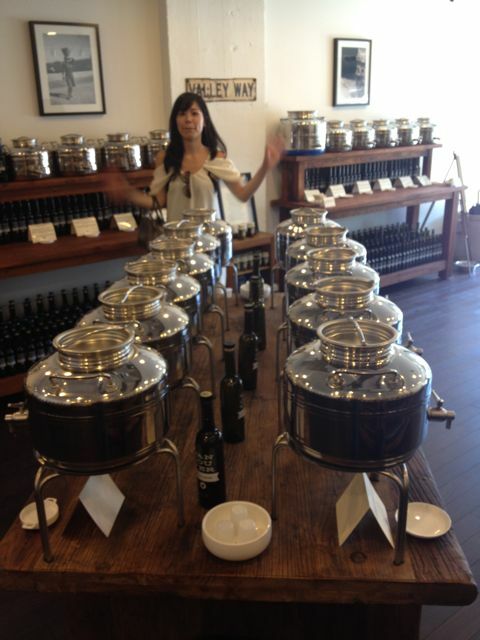 Akemi and I were out and about today, running errands, when we happened across The Vancouver Olive Oil Company, a delightful little shop on West Broadway (2571 W. Broadway to be exact). Having recently read an article on the poor quality of the olive oil sold in most supermarkets (ranging from old stock to adulterated crap), I was intrigued and decided to check the place out. 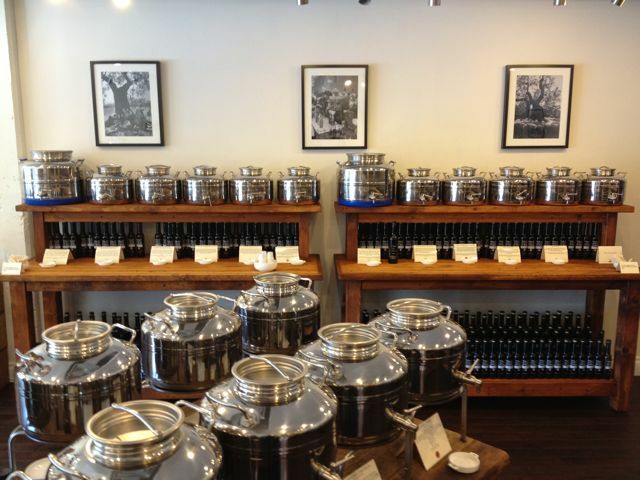 Opened in January of this year, Vancouver Olive Oil Company offers up a variety of high quality olive oils and balsamic vinegars from a number of different countries: Italian Favolosa, Spanish Manzanillo, olive oils perfumed with Persian Lime or Mushroom & Sage, Sicilian Lemon White Balsamic, and Espresso Dark Balsamic – to name just a few. Don’t know what you’re looking for? Well, you’re free to try any and all they have available because Vancouver Olive Oil Company is a shop AND tasting bar. Each of the 50 or so product selections are available for sampling and the friendly staff is more than happy to give you the rundown on the different offerings. We started with the medium to robust olive oils and were surprised by the subtle, and sometimes not so subtle, distinctions between them. We were each offered samples in a small, paper cup and instructed to warm the oil by placing it between our cupped hands for thirty seconds to release the scent and flavors. 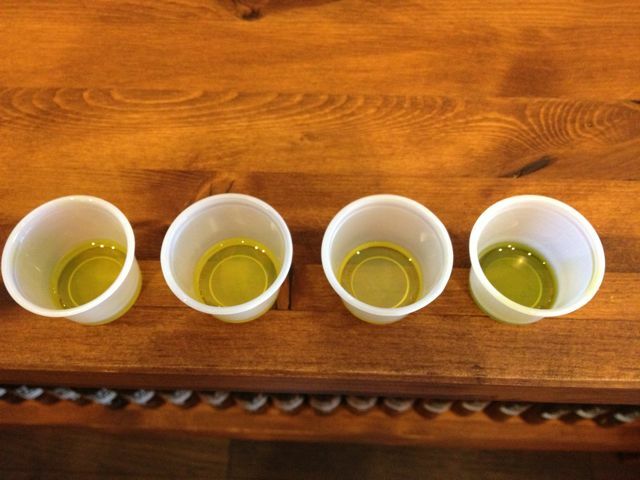 We ended up tasting about seven different olive oil varieties, noting their distinctive appearances, scents, and flavor profiles. Yes, in many ways, it was reminiscent of a chocolate tasting. What did you think I was going to compare it to? Wine? Akemi very much enjoyed the California Arbequina for its pronounced herbaciousness while I preferred the Spanish Picual for its peppery finish. I also liked the lighter Leccino which makes use of Tuscan olives. We then moved on to the Balsamics lining the walls, 12 year aged whites and 18 year aged darks. We ended up going with the Grapefruit White Balsamic, Fig Dark Balsamic, and a Red Apple Dark Balsamic. Akemi and I capped off our visit with a chat with owner Michaelanne Buckley, a woman who is clearly passionate about (and knows) her olive oil. It’s fascinating stuff. Along with the glorious oils and balsamics, I also picked up a book, Extra Virginity: The Sublime and Scandalous World of Olive Oil, by Tom Mueller. Should make for some very interesting reading. If you’re in the area, check them out. Or head on over to their website for information on their company philosophy, products, and the 411 on oleic acid, free fatty acids, and polyphenol counts. The Weird Food Purchase of the Day video series returns with guest sampler, Akemi, who tries North American grape soda for the first time. And loves it! Akemi takes a sip, makes a face like she just swallowed a hairball. Akemi: I don’t like it. 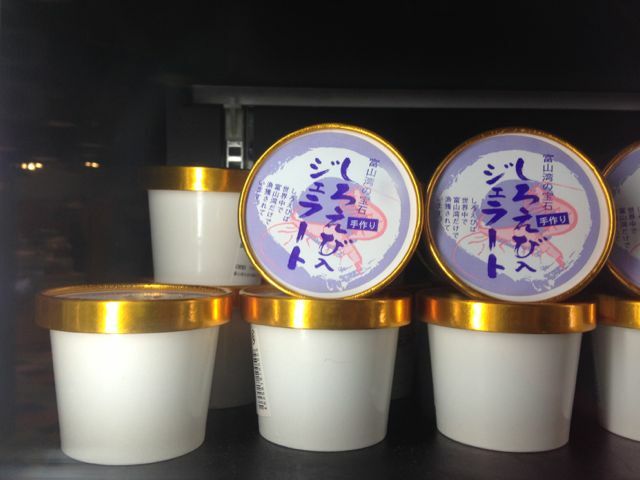 Akemi: Tastes like for kids. I’m not kids. (beat) Like…this one is Fanta. Fanta Grape. Akemi: But you didn’t say that (taking another sip). Me: What fresh grape is purple? Me: If you don’t like it, why are you drinking it? She shoves the glass toward me. Me: You want to try my ice cream? 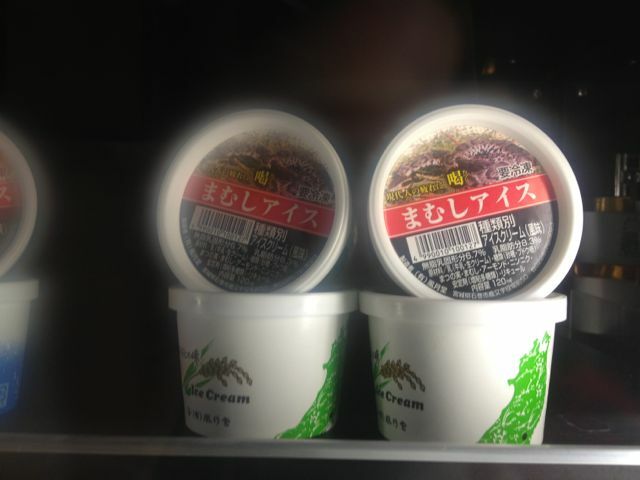 Akemi: No, I want to eat cone. The video ends there, but shortly after I stopped recording, she ate both my ice cream AND cone. I was never a big fan of any of the ascension-themed stories but this one has little to do with actual ascension and everything to do with Rodney and the relationships he’s formed over the course of his time on Atlantis. 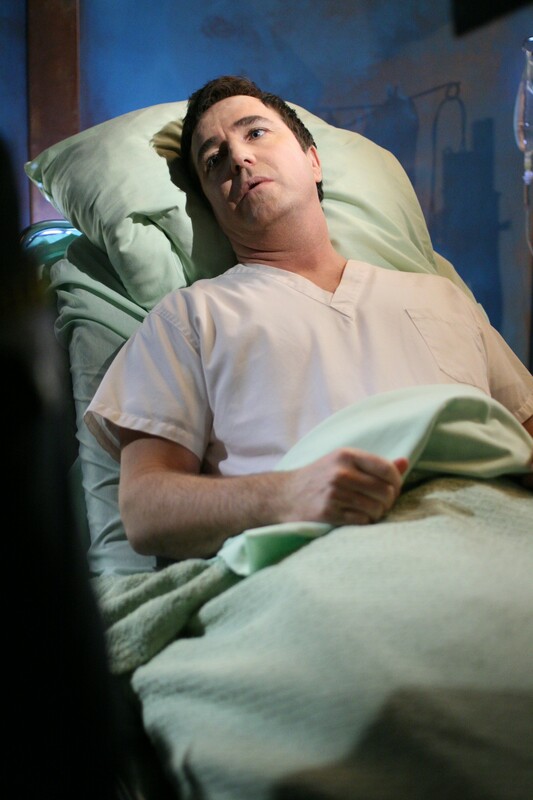 More than all the talk about ascension or even the danger McKay faces, what stands out for me in this episode are the small acts of kindness that Rodney performs in the face of his imminent death. Meditating with Sheppard, hugging Ronon, writing up a list of the great things Weir has done as Commander, keeping Teyla company during an Athosian ceremony, giving Radek a pep talk – these are all actions that come, not as a result of a change he has undergone, but from the heart of a guy who realizes he may never again have the opportunity to do these things with his friends. Great. 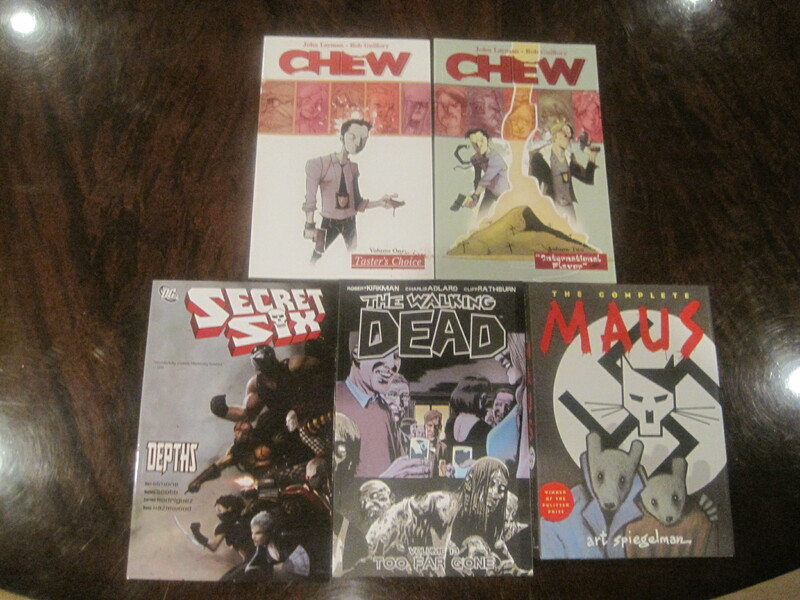 November 24, 2010: Comic haul! The return of the Weird Food Purchase of the Day! 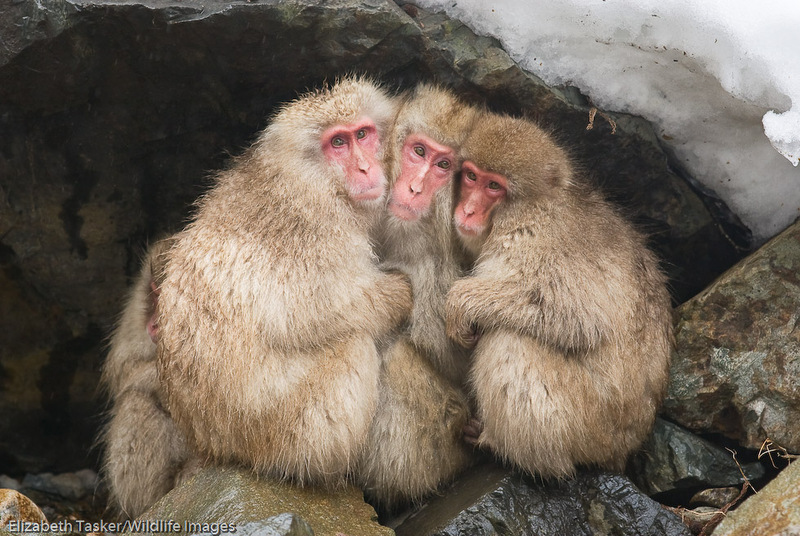 Snow Monkeys go for their sixth win eight games! I’ve come to prefer collections over single issues and these were a few of the titles I’ve been meaning to pick up for a while. Chew: Police detective Tony Chu uses his cibopathic abilities to solve crime, deriving psychic sensations from whatever he consumes. As a foodie, how can I NOT check this one out. Secret Six: Gail Simone’s awesome re-launch follows a team of calculating yet colorful and charismatic villains who take on the missions those other super groups would never dream of tackling. The Walking Dead: Enjoying the series on AMC? Well, check out the comic book that inspired it. It’s even better. Maus: A Survivor’s Tale: In this Pultizer Prize-winning work that took thirteen years to complete, the author uses metaphor to tell the tale of a Jew living in Poland under Nazi rule. Considered among the greatest graphic novels of all time. All quiet on the Stargate front as the cast and crew head their separate ways to work, enjoy the holidays, and await word on a potential third season. Meanwhile, post-production continues (as Kerry, our post-production coordinator will frequently remind us) with Day 1 Mixes of Deliverance and Twin Destinies, and a Day 2 Mix of Alliances on deck. And, given the way the schedule looks to be playing out, I’ll probably be receiving delivery of the Day 1 Mix of The Hunt at The Imperial Hotel in mid-December. Today’s weird food purchase of the day comes compliments of blog regular Laura who spotted a package of Astronaut Ice Cream at the U.S. Space Camp gift shop and thought of me. Thanks, Laura. My Snow Monkeys managed to eke out the closest of victories last weekend, beating rival Tio’s Juice Monkeys by a measly six point margin. Still, a wins and win, and this puts my Snow Monkeys at 5-2 since starting the season 0-3. Tough match-up ahead this weekend versus Ian’s Lightning. I’m not enamored of either of my QB match-ups (an underwhelming Matt Schaub at home against an improved Titans D, and Matt Ryan at home against a tough Packers D), but will go with the hot hand and start Ryan. My RB starts are no-brainers: Houston’s phenomenal Arian Foster will be picking up slack this weekend by running up and down that field, while the 49ers Frank Gore will rebound off a disappointing game last weekend to trample the Cardinals on Monday Night. My kicker, the Titans’ Bironas, is battling a groin injury but should be okay to start. I hope. Not loving either my TE (Balitmore’s Heap) or Defense’s (Ravens) chances this weekend and hoping the wide receiving corps will pick up the slack. Donald Driver and Santana Moss have been slowed by injury while Seattle’s Mike Williams is nursing a mystery injury of his own (that, if rumor is to be believed) could keep him out of action beyond this week. That leaves me with four candidates to choose from. Who should I start? The Cowboys’ Dez Bryant (has been on fire but is up against the #1 ranked pass defense in the Saints), Percy Harvin (despite nagging injuries, migraines, and having Brett Favre as a quarterback, he consistently puts up the big numbers – and the fact that they’re playing the Redskins’ porous pass offense helps), Danny Amendola (Sam Bradford’s go-to-receiver will be up against a cranky Broncos’ D in Denver), and Steve Breaston (ever dependable even with Anderson throwing to him). Or, I could snap up a couple of the receivers I’ve been eyeing on the waiver wire. Thoughts? Answer: The aliens didn’t know they would just end up dying again. They assumed they had “fixed” them. Answer: Considering Caine had no knowledge of baby Carmen, the latter theory seems to hold more weight. Answer: Well, given Destiny’s ability to detect cosmic phenomena (see next episode), one might assume the ship fashioned the vision in a way that it would appear true to T.J. in order to spare her the pain of losing her daughter. Either that or there’s more to the vision than everyone assumes. Answer: And then you proceed to stalk the cousin, call her names, and wish her dead. The end. (P.S. “The reasonable side of you says, fine, keep her around”? The REASONABLE side?). Answer: I didn’t find Caine to be either touchy-feely or flighty. He was a clearly a man of science whose outlook was informed by his faith. Like you, his beliefs did not preclude him from accepting the logic of science. Ultimately, when faced with an inexplicable otherworldly scenario, he chose to trust in God rather than the mysterious god-like powers of benign aliens. And, in the end, even if the latter explanation proved more likely, he remained steadfast and strong in his faith. I found that admirable rather than a show of weakness. Answer: Rush turned off the neural link in Trial and Error. If he or anyone started seeing Gloria or Franklin again, it would be cause for concern. October 22nd: The Return of the Weird Food Purchase of the Day! A little something I like to call…The Triple Down! And another au revoir! It’s been a while since my last Weird Food Purchase of the Day video installment so, today, I rectify that in grand style with a little something I like to call The Triple Down. Then take one Krispy Kreme original honey-dipped doughnut. Cut the doughnut in half. 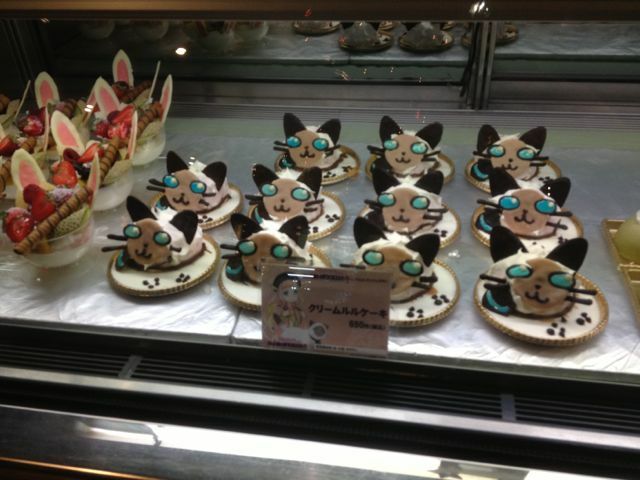 It will form the bun for your sandwich. And voila! The Triple Down! It was a little dry and could have used more of the Colonel’s secret sauce. That or another dollop of mayo. It was also extremely salty. 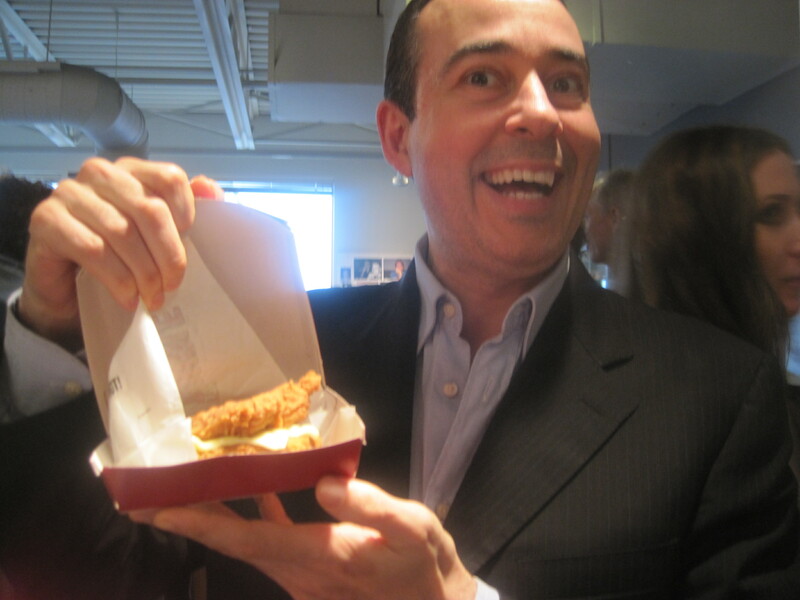 Paul likened it to eating a fistful of McDonalds french fries. On the positive side, the chicken married quite nicely with the doughnut. 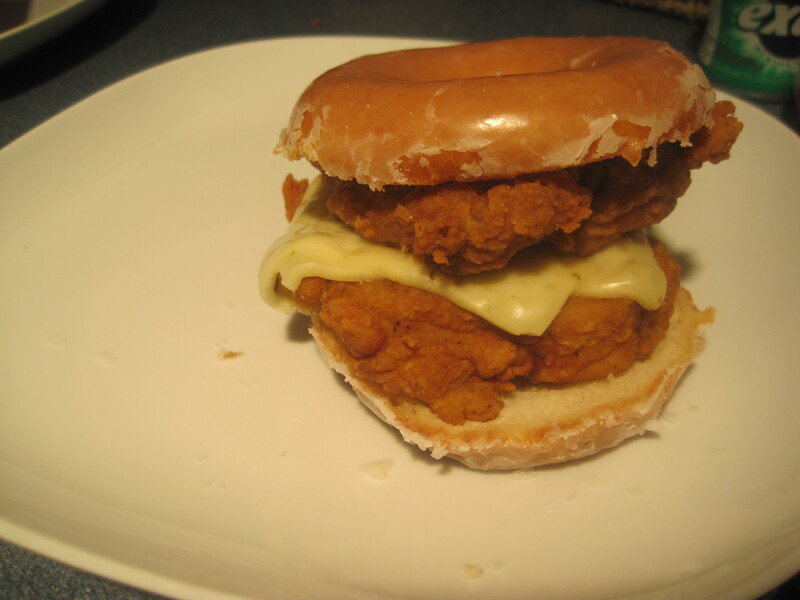 The cheese did not – but that won’t stop me from trying one of those Krispy Kreme cheeseburger sliders one day. As I chowed down, I couldn’t help but think: “You know who would’ve enjoyed this? 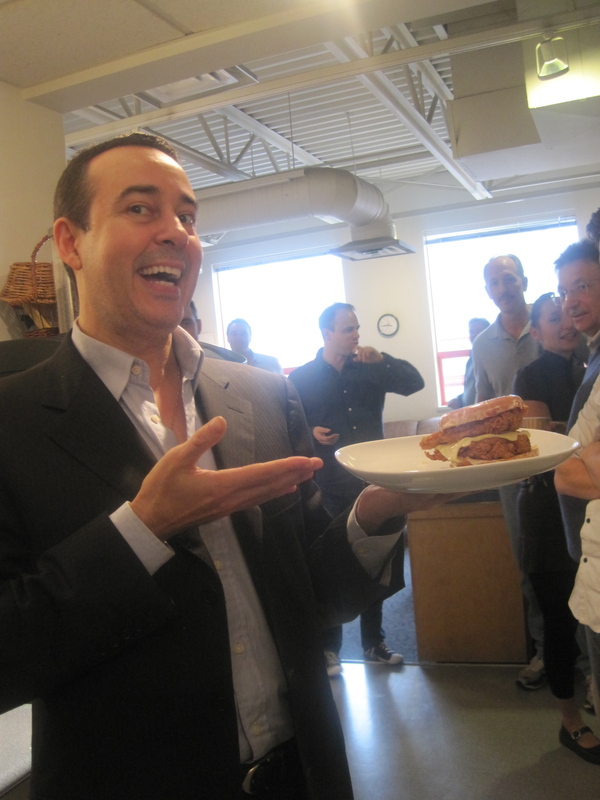 Rob Cooper and Martin Gero.” Not the sandwich itself, but the sight of me eating it. It made wistful. Then, slightly nauseous. So, the verdict = Sweet, very salty, a tad try, and somewhat dizzy for about twenty minutes after consumption. Paul suggested we try and top it next week by deep-frying the whole in a taco shell. Top with ice cream and voila! The Quadruple Down! And, quite possibly, quadruple bypass. Anyway, thanks to everyone who helped to make Triple Down Friday happen. 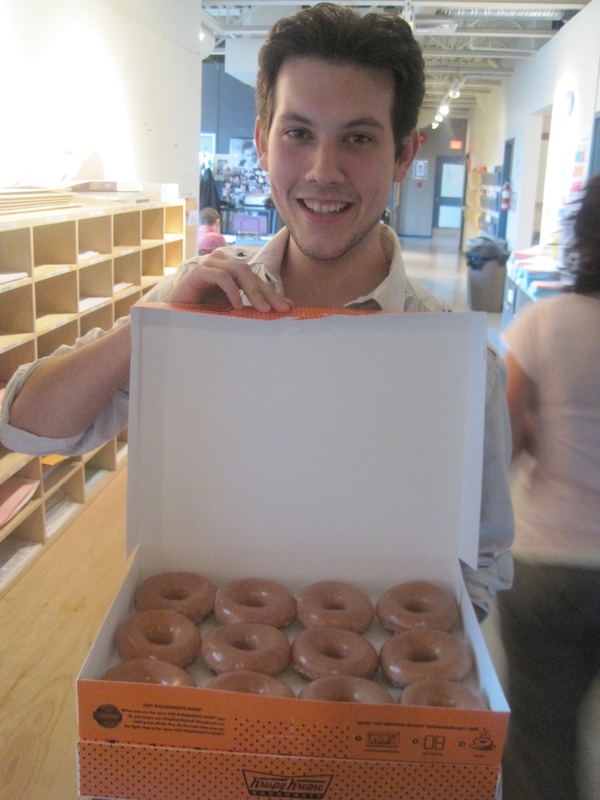 Ken for driving all the way to Delta to pick up the doughnuts. Ashleigh for going to KFC and waiting in line for the Double Downs. And, of course, everyone who was on hand to lend their support in this most noble of endeavors. 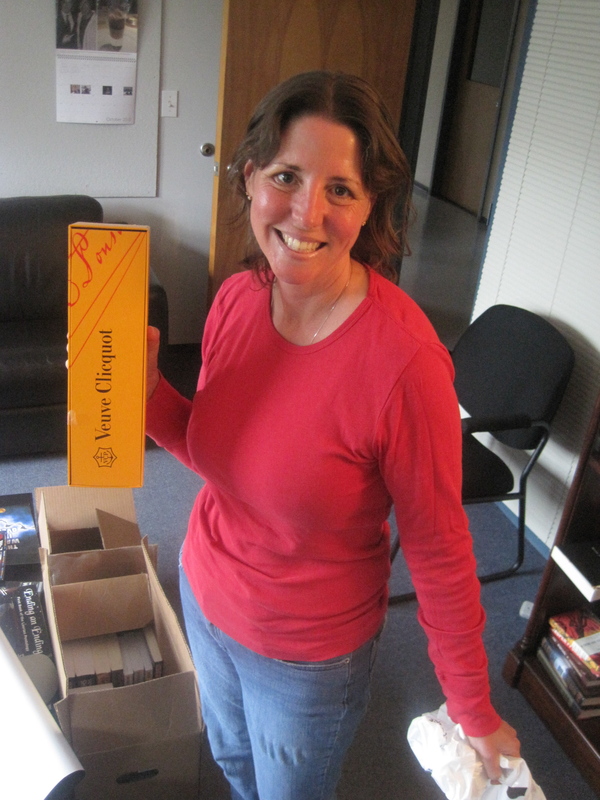 I think it's champagne but, to be fair, I didn't actually open the box. It may well contain a rabbit's foot and a brick. But I'd cherish them nonetheless. Many thanks to both Remi and Linda for their contributions to SGU’s second season. The next month won’t be the same without you. You may have gained a friend in me, but I have gained much, much more. 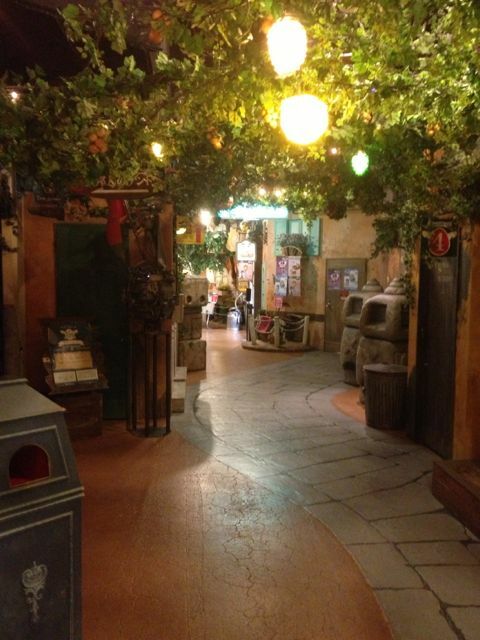 Not one but TWO places to stay the next time I’m in L.A.! October 22, 2009: Julia Benson! Jennifer Spence! Birthday Swag! The Weird Food Purchase of the Day! Well, hey! Look whose IMDB starmeter has skyrocketed 360% this week! None other than SGU’s Second Lieutenant Vanessa James, Julia Benson (formerly Anderson). Yes, she’s gorgeous – in addition to being a total sweetheart. AND a wonderful actress, which you’ll find out for yourself in the coming weeks. 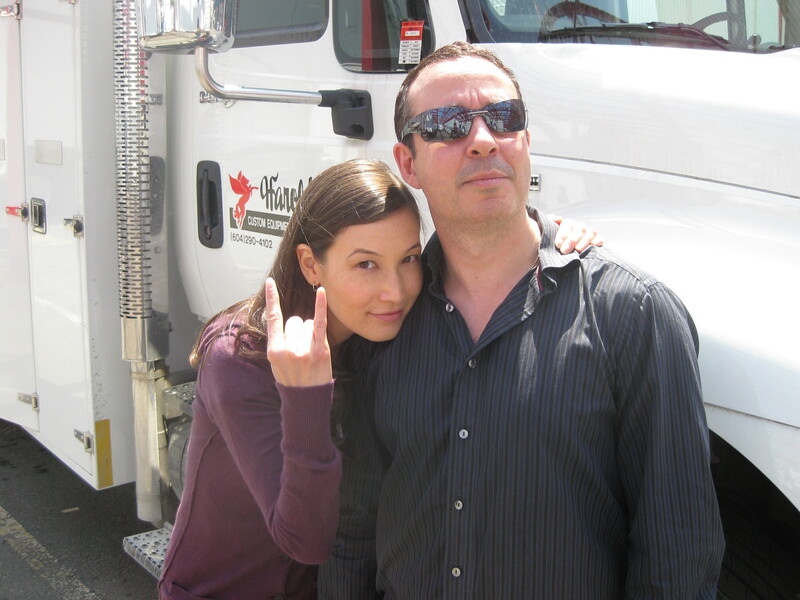 Also, actress Jennifer Spence (SGU’s Lisa “Earthquake Girl” Park) joins twitter (http://twitter.com/SpenceJen). 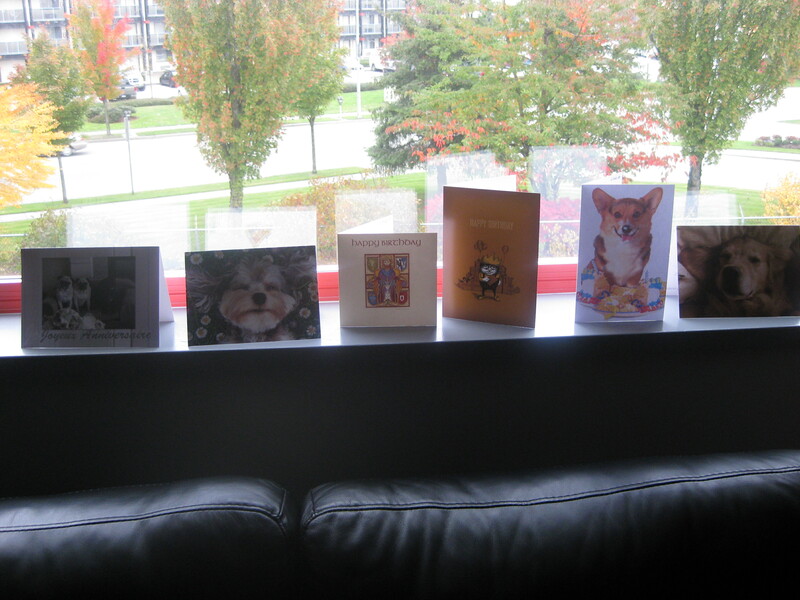 Birthday cards. The one on the very left, sent by Anais33, sports a pic of my three pugs (Bubba, Jelly, and Maximus). 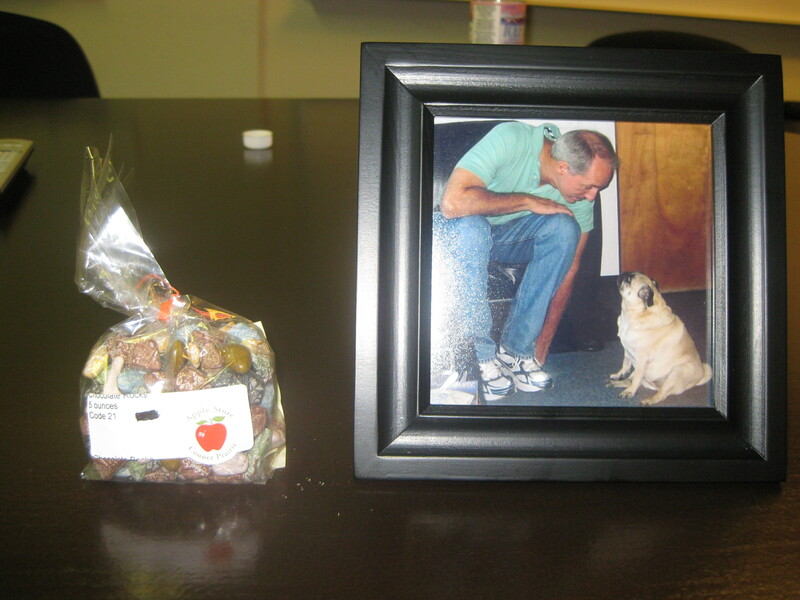 Chocolate rocks and framed pic of two of my faves (Carl and Jelly). 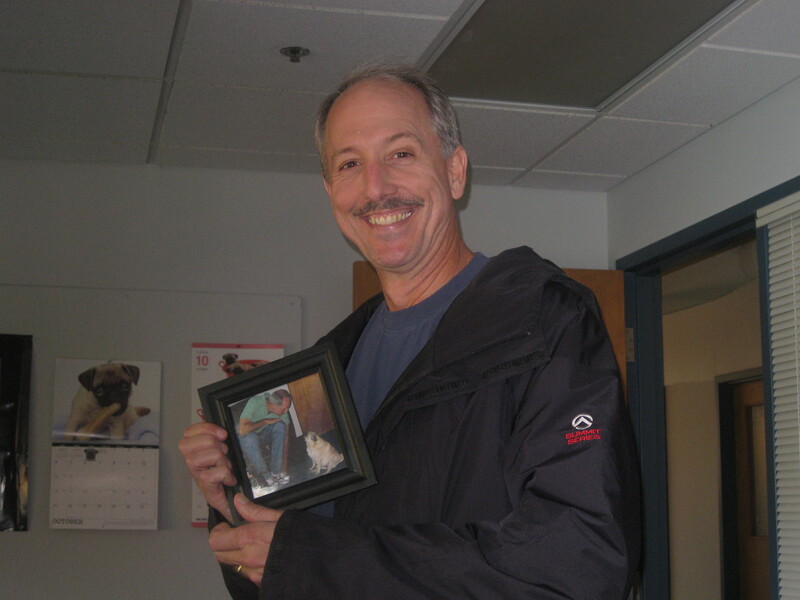 Carl claims possession of my gift. It now sits atop HIS desk. 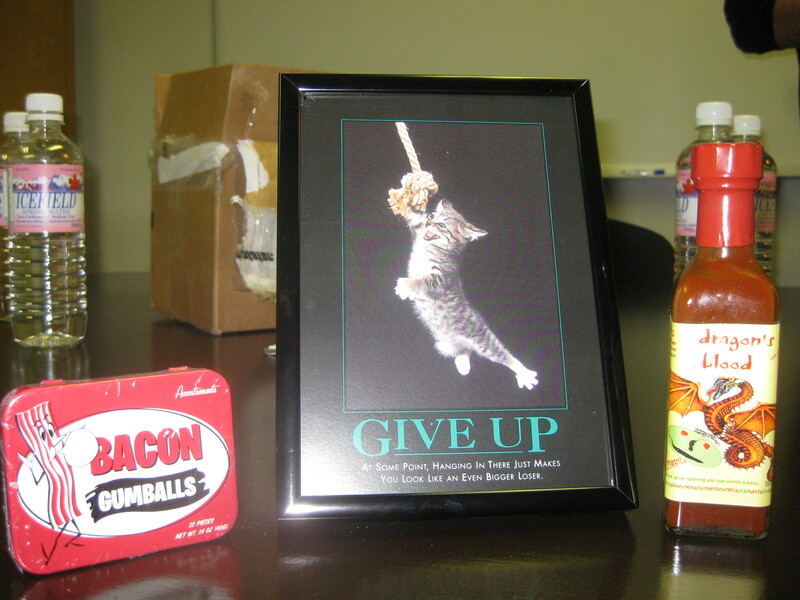 Bacon gumballs, a picture/frame, and hot sauce. 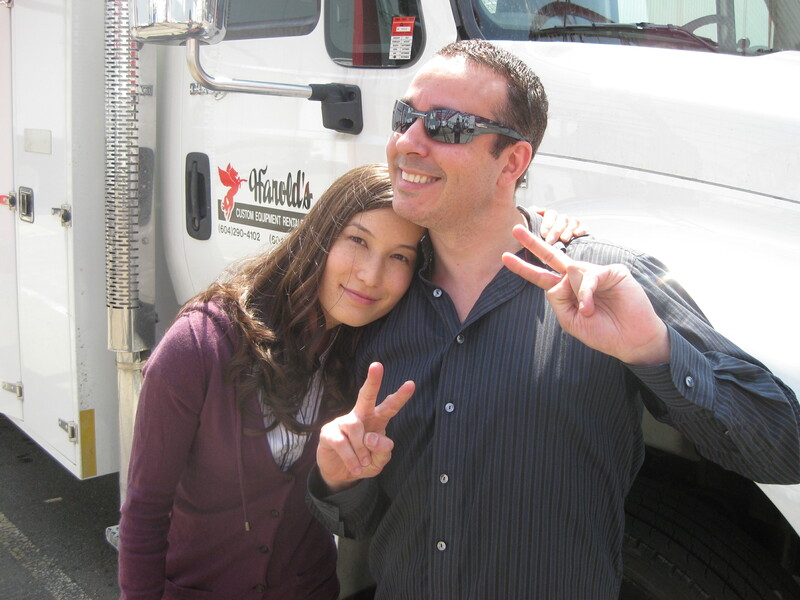 October 6, 2009: My Anti-Entrepreneurial Spirit! The Weird Food Purchase of the Day! And the Cost of a Free Newspaper! Every so often, someone will ask me about my blog traffic, wondering how many visitors I get on an average, a month, to date. And, when I tell them, they’ll inevitably follow-up with the same question, always wanting to know how much money I make off this blog. My response, “Nothing.”, tends to engender responses ranging from pity and disbelief to bug-eyed outrage at the thought of my anti-entrepreneurial venture. Yes, in retrospect, had I charged each and every one of you a fee for the pleasure of reading entries like my edifying treatise on the inherent frustrations of mango consumption (http://josephmallozzi.wordpress.com/2007/01/21/january-20-2007/), I could own a small island by now (provided every visitor shelled out $100 every time they dropped by which, let’s face it, is more than likely). On the other hand, I could have gone the ad route, seamlessly incorporating advertisements for acai juice and penile enhancements into my daily ramblings in which case, by now, I could have made enough to purchase my own Vespa. Meh. The only reason I bring it up is because there was a report on blogging on CNN today and, at one point, some “professional blogger” expressed her outrage at part-time bloggers who were undermining her potentially lucrative business opportunities. I can just imagine her indignation if she were ever to stumble upon this blog (“How the hell am I going to make money off my mango rants when this sonovabitch is giving it away for free?!!!). WTF?! Against my better judgment, I answered the door today when someone came a knockin’. The someone, in this case, was a young man who happily informed me that starting next week, he would be delivering copies of the local newspaper to my front door every morning. I told him I didn’t subscribe to any paper and had no interest in doing so. Well, according to him, the service was absolutely free. All he needed to know was which of the city’s two craptacular newspapers I wanted to receive: The Vancouver Sun or The Province. “I won’t read them,”I assured him. “But if you could just pick one,”he persisted. I went with…neither. Apparently, that wasn’t one of my options. I could not choose NOT to receive a newspaper. “I really don’t want either paper,”I stuck to my guns. He asked me for my name and phone number – neither of which I was comfortable giving him despite his assurances that they weren’t for the newspaper but for him alone. Oh, really? Only for your personal use, you say? Then, by all means! I imagined being awakened by a phone call at three in the morning several months down the line, and being greeted by some unfamiliar voice: “Hey, Joe, it’s Troy your newspaper boy. I’m downtown and way too drunk to drive. Can you give me a lift home?”. No, no. I don’t think so. Well, when it became clear that he wasn’t going to get my name and phone number, he packed away his notepad – which, I assumed, signaled his departure. But I assumed incorrectly because no sooner had he pocketed the notepad than he produced a second notepad and casually informed me that he was gathering a nominal fee of three dollars a week that would go toward his tuition and rather than have him bug me every week wouldn’t it be easier to just have me give him a lump sum up front. “What happened to free?”I asked. Seriously. He may as well have told me that they’d adopted him and were raising him as one of their own. Let’s put it this way – many adjectives come to mind when I think of my neighbors. “Generous” aint one of them. In the end, I made it clear I wasn’t going to pay anything for a free paper I wasn’t going to read and, hey, I had a caponata on the stove and had to go. He suggested he come back at a more convenient time. I proposed Saturday. And I’ll make sure to be out watering my front lawn when he comes by. 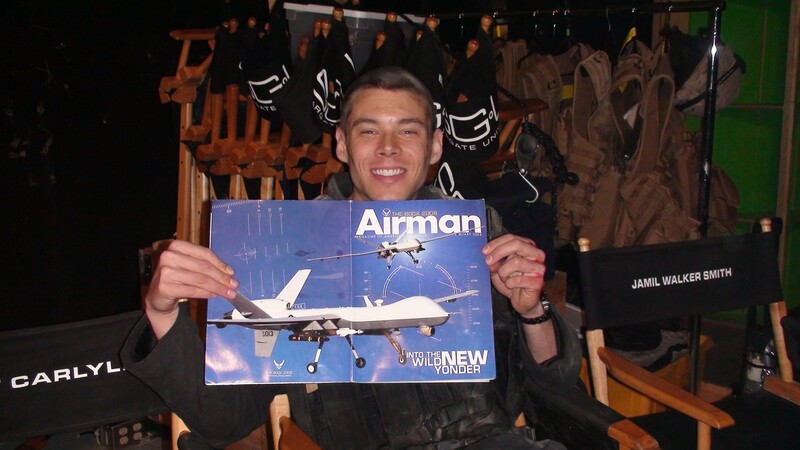 September 6, 2009: Brian J. Smith Wants To Hear From YOU! Smells Like Burning! Sick Sick Sick! And The Return of the Weird Food Purchase of the Day! Okay, let’s make it official. Actor Brian J. Smith – SGU’s Lieutenant Matthew Scott – is eager to take part in his very first fan Q&A, so if you have any questions for the Julliard grad, start posting them. 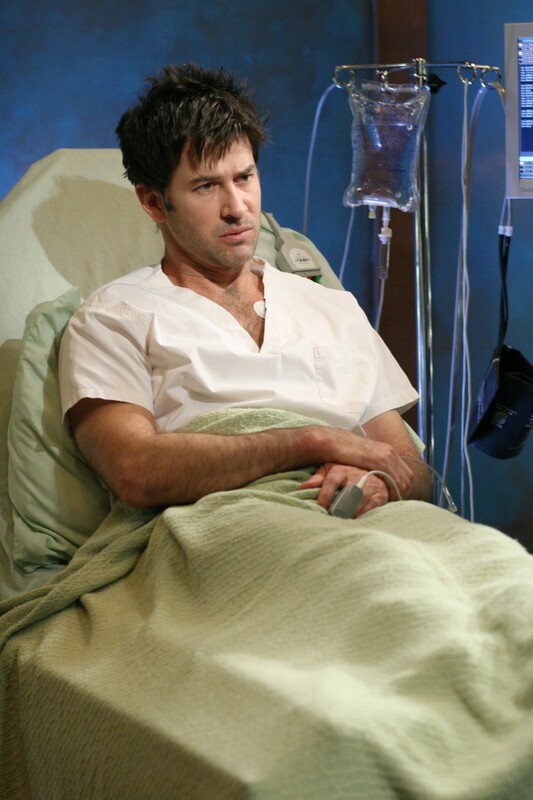 One thing that was fairly evident from my chat with him on Friday night – Brian has been touched and overwhelmed by the fan response to both his character and the show as a whole. So let’s give him a big fandom welcome here on this blog…by being extremely nosey. Brian J. Smith researching his role. Hey, you ever have that sudden anxiety kick in, sort of that panicked sensation you’d feel if, say, you realized you’d forgotten the steel cut Irish oatmeal on the stove that was by now undoubtedly burnt beyond recognition and on its way to triggering the smoke alarm? Well, I had that happen to me this morning – after I realized I’d forgotten the steel cut Irish oatmeal on the stove that was burnt beyond recognition and very close to triggering the smoke alarm. Needless to say the oatmeal was D.O.A. It’s touch and go for the pot. I opened all the doors and windows to air out the place and thought I’d done a pretty good job, until I returned from a trip to Granville Island to discover the house still smelled like burnt oatmeal which, strangely enough, possesses an odor akin to lingering fish. I’d light one of those scented candles but for fear that I’d probably burn the house down. As it turns out, it’s great fire weather here in Vancouver. Yep, the rainy season is upon us and, for those who don’t know, it goes from now until about a month from now next year. To be honest, I don’t really mind the rain as it stirs distant memories of my youth. But, then again, so does the smell of skunk. Finally, I conclude today’s entry with the return of the Food Purchase of the Day video installment. Enjoy. I know I didn’t.